Kyle Hansen of the Kyjen Company sent me three different Outward Hound carriers to try out and review. Kyjen has not paid for these reviews, and when I warned Kyle that they might not be love-fests, he said, essentially, “let ‘er rip.” Dog Jaunt’s review policy requires me to give away freebies valued at over $50, and Kyjen has agreed that the products will be given away to Dog Jaunt readers. Here’s the first review, of Outward Hound’s Sling-Go Pet Sling. It will be given away to one lucky reader in a giveaway starting on Monday, December 28! I first saw this sling in action at our local dog park. A woman had carried her disabled dachshund to the small ‘n’ shy area, a place where he could meet other small dogs safely, and while we watched him shuffling curiously around Chloe I asked her about the sling. Both he and his owner were pleased with it, I learned — it was the dachshund’s main mode of transportation — and I was intrigued enough to ask for one, some months later, to review. I gave it a test run on a day of chaos. The house was full of contractors, and the work they were doing required a good deal of input from me. Chloe needed exercise (which I couldn’t give her until the contractors left) and bitterly resented being behind dog gates in the kitchen. In desperation, I grabbed the sling, draped it across my chest, and dropped Chloe in. It worked like a charm. The sling is made of a sturdy polyester twill fabric, elasticized along the open sides. The bottom is slightly padded, in case you need to set your pet down in it. 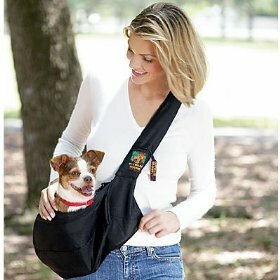 It is surprisingly capacious — at 13 lbs., Chloe is a large small dog, and she fit in the sling comfortably. She chose not to lie down, but she could have. Instead, she sat upright (if sitting is what you can call it — it’s a sling, after all) and gazed at the contractors with interest. There is a clip halfway along the open sides that can be closed to keep the sling from gaping open, but this is by no means a stealth bag. At very least, your dog’s fur is visible; more often, her head and shoulders will be visible too. There are also clips at each end, presumably to clip to your dog’s harness. The shoulder strap is broad (though not padded) and a large clasp allows you to fit the strap around you, if you prefer that to hoisting it over your head. The strap also includes a tiny built-in zippered pocket, big enough for a key or a couple of poop bags or treats. The bag is well-designed and well-made. Although I tired of carrying Chloe around after a while, I lasted much longer with this sling than I ever have holding her in my arms, and it handled her weight with ease. It could handle dogs slightly larger than she is, I believe — say up to 20 lbs. — though heaven help your shoulders. Padding on the shoulder strap would be a nice addition, but I’m otherwise very pleased with this carrier.